By late 1944 there were 23 RAF squadrons operating Typhoons from bases on the continent and the aircraft played a major role in defeating the German army in the west by roaming the skies over the enemy. 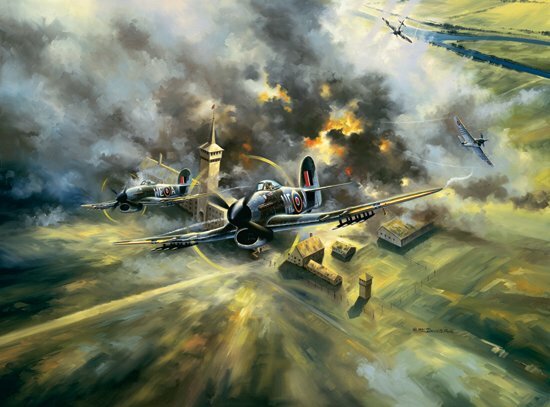 This print shows the fire power of the Typhoon as Squadron Leader Marten T.S. Rumbold leads his renegades in an attack on an enemy vehicle Repair Depot in Doetinchem, Holland, on March 19, 1945.